The Rubian magnesite deposit (West Asturian—Leonese Zone, Iberian Variscan belt) is hosted by a 100-m-thick folded and metamorphosed Lower Cambrian carbonate/siliciclastic metasedimentary sequence—the Cándana Limestone Formation. It comprises upper (20-m thickness) and lower (17-m thickness) lens-shaped ore bodies separated by 55 m of slates and micaceous schists. The main (lower) magnesite ore body comprises a package of magnesite beds with dolomite-rich intercalations, sandwiched between slates and micaceous schists. In the upper ore body, the magnesite beds are thinner (centimetre scale mainly) and occur between slate beds. Mafic dolerite dykes intrude the mineralisation. The mineralisation passes eastwards into sequence of bedded dolostone (Buxan) and laminated to banded calcitic marble (Mao). These show significant Variscan extensional shearing or fold-related deformation, whereas neither Rubian dolomite nor magnesite show evidence of tectonic disturbance. This suggests that the dolomitisation and magnesite formation postdate the main Variscan deformation. In addition, the morphology of magnesite crystals and primary fluid inclusions indicate that magnesite is a neoformed hydrothermal mineral. Magnesite contains irregularly distributed dolomite inclusions (<50 μm) and these are interpreted as relics of a metasomatically replaced dolostone precursor. The total rare earth element (REE) contents of magnesite are very similar to those of Buxan dolostone but are depleted in light rare earth elements (LREE); heavy rare earth element concentrations are comparable. However, magnesite REE chondrite normalised profiles lack any characteristic anomaly indicative of marine environment. Compared with Mao calcite, magnesite is distinct in terms of both REE concentrations and patterns. Fluid inclusion studies show that the mineralising fluids were MgCl2–NaCl–CaCl2–H2O aqueous brines exhibiting highly variable salinities (3.3 to 29.5 wt.% salts). This may be the result of a combination of fluid mixing, migration of pulses of variable-salinity brines and/or local dissolution and replacement processes of the host dolostone. Fluid inclusion data and comparison with other N Iberian dolostone-hosted metasomatic deposits suggest that Rubian magnesite probably formed at temperatures between 160 and 200°C. This corresponds, at hydrostatic pressure (500 bar), to a depth of formation of ~~5 km. Mineralisation-related Rubian dolomite yields δ 18O values (δ 18O: 12.0–15.4‰, mean: 14.4±1.1‰) depleted by around 5‰ compared with barren Buxan dolomite (δ 18O: 17.1–20.2‰, mean: 19.4±1.0‰). This was interpreted to reflect an influx of 18O-depleted waters accompanied by a temperature increase in a fluid-dominated system. Overlapping calculated δ 18Ofluid values (~+5‰ at 200°C) for fluids in equilibrium with Rubian dolomite and magnesite show that they were formed by the same hydrothermal system at different temperatures. In terms of δ 13C values, Rubian dolomite (δ 13C: −1.4 to 1.9‰, mean: 0.4±1.3‰) and magnesite (δ 13C: −2.3 to 2.4‰, mean: 0.60±1.0‰) generally exhibit more negative δ 13C values compared with Buxan dolomite (δ 13C: −0.2 to 1.9‰, mean: 0.8±0.6‰) and Mao calcite (δ 13C: −0.3 to 1.5‰, mean: 0.6±0.6‰), indicating progressive modification to lower δ 13C values through interaction with hydrothermal fluids. 87Sr/86Sr ratios, calculated at 290 Ma, vary from 0.70849 to 0.70976 for the Mao calcite and from 0.70538 to 0.70880 for the Buxan dolostone. The 87Sr/86Sr ratios in Rubian magnesite are more radiogenic and range from 0.71123 to 0.71494. The combined δ 18O–δ 13C and 87Sr/86Sr data indicate that the magnesite-related fluids were modified basinal brines that have reacted and equilibrated with intercalated siliciclastic rocks. Magnesite formation is genetically linked to regional hydrothermal dolomitisation associated with lithospheric delamination, late-Variscan high heat flow and extensional tectonics in the NW Iberian Belt. 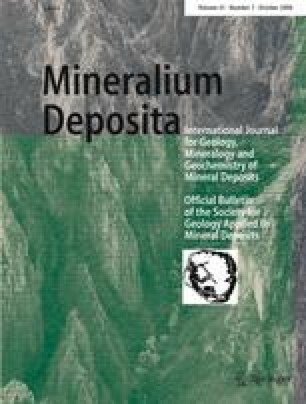 A comparison with genetic models for the Puebla de Lillo talc deposits suggests that the formation of hydrothermal replacive magnesite at Rubian resulted from a metasomatic column with magnesite forming at higher fluid/rock ratios than dolomite. In this study, magnesite generation took place via the local reaction of hydrothermal dolostone with the same hydrothermal fluids in very high permeability zones at high fluid/rock ratios (e.g. faults). It was also possibly aided by additional heat from intrusive dykes or sub-cropping igneous bodies. This would locally raise isotherms enabling a transition from the dolomite stability field to that of magnesite. Financial support for this work has been provided by project BTE2001-1443 (Ministerio de Ciencia y Tecnologia). We wish to thank D.P. Rodriguez (Magnesitas de Rubian S.A.) for advising and for facilities given during the development of the investigation, and M. Regueiro and M. Lombardero (IGME) for collaboration during fieldwork. Thanks are also due to J.R. Martínez Catalán, R. Arenas and G. Gutierrez-Alonso for valuable discussions on the regional geology. We thank D.P.F. Darbyshire, NERC Isotope Geoscience Laboratory (NIGL) and J. Naden, British Geological Survey (BGS) for critical and constructive reviews of the manuscript. Acknowledgements are extended to F. Tornos for his critical review that significantly improved the original manuscript. Thanks are extended to geologist K. Detsi (National and Kapodistrian University of Athens-NKUA) for logistic help and to E. Michailidis (NKUA) for technical assistance with SEM–EDS analysis.